This year was an example of extremes. Like last year I visited two comic shops---in fact the same shops as last year---only this year the closer tourist-driven-business shop had a line snaking out of the hallway where one of their two entrances is located. The other entrance was locked up tight. Last year I entered through that now-closed door and grabbed my allotted three books. This year, though, as the minutes creeped up to thirty for having waited, I'd made up my mind to ditch it altogether and head to mt main shop. At that moment a lady came out and let us all know that we'd all be inside in just a few minutes and that we'd be allowed eight books. 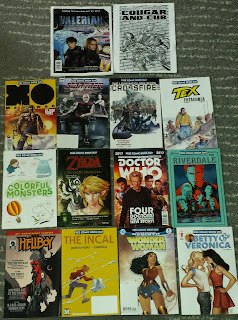 Just the idea that we could grab eight free comics was enough incentive to keep me in line. It would take another hour to get in, and when that time came I got to see the ransacking that had taken place. Piles were decimated and the remains were occasionally obscure. That's one way to hurry along the day: let people take a bunch of books and hope they shop as well. Before making it inside, I got the first free comic of the day: Cougar and Cub, the white papered indie comic below in the top row. It was a single 11x17 with a cover and three other pages of content. The concept is a superheroine (Cougar) who fights crime with her sidekick (Cub), who is also her young lover. The other book on top in the below picture is Valerian, a reprint of a French comic of the same name from the '60s. They are finally getting around to making a movie about Valerian and Luareline, a duo of which I'd never heard. This book was a freebie that was given out as we waited in line. "Don't worry, " we were told, "this won't count toward your 8 free comics." Point Central, so the story goes, is the point of which the most traveled space voyagers pass and has, over the millennia, developed into a series of augmented civilizations---a planet sized space-ship hodge-podged city. Some sectors can't even visit others, and each civilization gets a chance to be the leaders of the governing council. Of course when the earthlings are given their chance, they move to make their rule permanent. This was an exciting story and one I'd be interested in pursuing later and checking out on my moving-picture screen. From X-O to Riverdale represent the 8 titles I picked up from Shoreline Comics after waiting for 90 minutes to get inside. Also, I didn't buy anything that day, feel adequately guilty even now, and will return to purchase something soon enough. X-O Manowar: This is the Valiant FCBD offering and the book that motivates me to head out on these Saturdays. There is a tiny amount of non-essential content for the X-O-in-space storyline and a preview of their Secret Weapons title and a bit of other reprinted content. As always, this Valiant homer is on board. Beyond that there weren't too many titles I was actually looking for. And by the time I made it inside at Shoreline, I started to just grab things that either a) I hadn't heard of; or b) that I was mildly interested in. Star Trek: TNG: Mirror Broken: I'd heard about this title--the Mirror Broken story--somewhere. I am a fan of Star Trek: TNG, and my wife and I have gone to see a few of the newer movies, but I don't consider myself a Trekkie. The Mirror Universe, I hear, made appearances on the Original Series, and had copies of everyone from the show that were now evil...or something. I thought that if given the opportunity and scarcity of other properties, I'd pick this book up. Just those circumstances presented themselves on FCBD 2017. I haven't read it yet, but the art looks like Clayton Crain's painting work from 4001 AD, which is great. There are also short excerpts of a new series based on the new movies and even the Green Lantern/Star Trek crossover. Crossfire: The Looking Glass Wars: I had to look up this content. I grabbed it totally blind, just looking for something different. The art inside resembles German expressionism, and frankly that was enough for me. It turns out that the "Looking Glass Wars" is the title of an entire series of stories set in the Wonderland of Lewis Carrol's creation. I'm not sure Alice makes any appearances. Tex: Patagonia: Another series I had to look up. Tex is a social justice warrior from the old west, a champion of the aboriginal American and the working man, an enemy of marauding hordes, a Texan who proudly fought for the North during the Civil War because he was such an abolitionist...he also was created in the 1950s by two Italian artists for the Italian market. Only Batman and Superman have been published as long in Italy as Tex, and only those two are remotely as well known in Italy as Tex. This FCBD copy is an excerpt of a newly translated award-winning graphic novel, and we're lucky enough that it is presented in color---the GN it comes from is still in black and white. Colorful Monsters: I picked this up because it was extra thick. It wasn't until later that I realized it was the FCBD offering from Drawn and Quarterly, a publisher of more artsy fare than normal comics, and this is a collection that speaks to that: heady works and think-pieces and some translated manga. Legend of Zelda Manga Collection: This reads from right to left and has excerpts from the manga adaptations of Twilight Princes and Ocarina of Time. In a different world I would have left this on the table, but I'm happy I have it. I think I may have been pushed by the idea I could use it as incentive for my kids. Doctor Who: Four Doctors: Ditto with the student dangling. I don't watch Doctor Who, but maybe I should. Riverdale: Like the Zelda manga, in another world I would have left this comic on the pile. But I have a soft spot for Archie The Survivor, even if the company did their part to muzzle comics over the decades. Also, I have a feeling this is turning into a Moment, with the show and new direction of the comics. 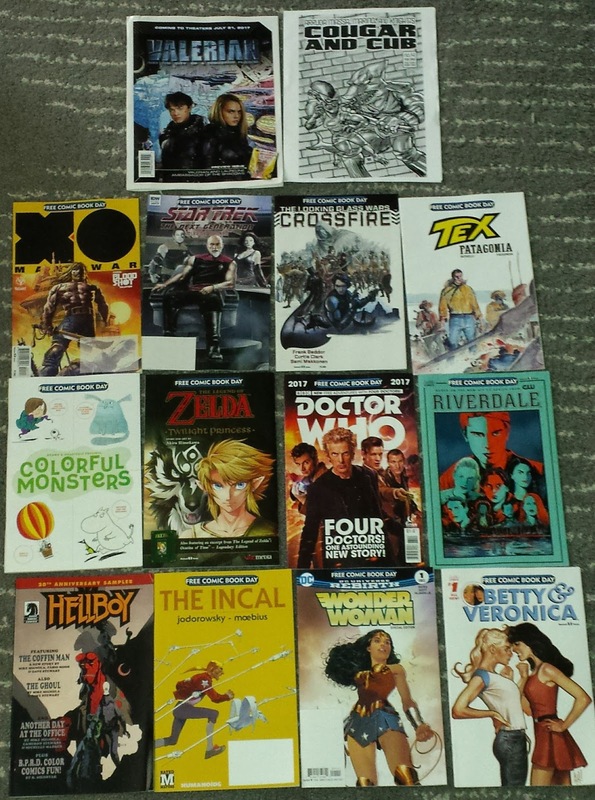 The bottom four comics I picked up at Pulp Fiction, and were at least items I had read about previously. Wonder Woman is one of those. Having a legitimate Moment. Hellboy 20th Anniversary Sampler: This comic isn't an official FCBD book, rather a sampler from 2014, but a give-a-way nonetheless. It's actually a pretty great issue, freebie or at cost. One piece is written by Mike Mignola and illustrated by Fabio Moon; one is both written and illustrated by Mignola; and there's a center spread of the funnies style work---jumbles and Peanuts/Family Circus-like parodies. The Incal: This is probably the only book I would have looked for besides X-O. It's the opening 26 pages from Jodorowsky's classic. I think it may have been hearing about this particular FCBD book that may have tipped me off to Jodorowsky's great comic epic Incal storylines. I'd known of his writing, his philosophy and his film making, but not of the details of his comic universe. After reading a synopsis, I quickly educated myself. I haven't picked up the complete works yet, but I'm considering it. If I could have had any two FCBD books, one would be the X-O, the other would have been this Incal issue, or the Wonder Woman issue, or the Lion Forge issue. Captain Canuck and the Star Trek TNG: Mirror Broken probably fill out the next tier. The Tick was sorely missed.